Time's running out! Click through now to seize your opportunity to win a suite of prizes from Wet & Forget. For over 35 years, Wet & Forget has offered a suite of cleaning solutions that are as user-friendly as they are effective. Whether you’re cleaning your vinyl siding or the bathroom shower, so long as you’re using Wet & Forget, you can put aside the hard work of scrubbing. Wet & Forget does it all for you. Best of all, you can apply Wet & Forget wherever needed without worrying, because these specially formulated cleaners are gentle and contain no bleach. • $3,100 Visa Gift Card. The closest thing to cash, this prepaid card can be used anywhere Visa debit cards are accepted. • The Handyman Package. 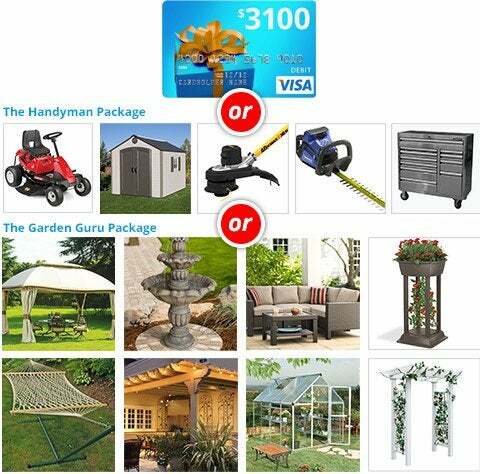 Perfect for DIY homeowners, prizes run the gamut from a riding lawn mower to a backyard shed. • The Garden Guru Package. Make over your outdoor area with a brand-new gazebo, garden fountain, greenhouse, and more. Don’t delay—only two regular weekly drawings remain in the Great Backyard Giveaway, so visit Wet & Forget today and seize your opportunity to win. Remember: Entering a regular weekly drawing instantly makes you eligible to win the grand prize. Enter multiple weekly giveaways, and you increase your odds of being the grand prize winner. 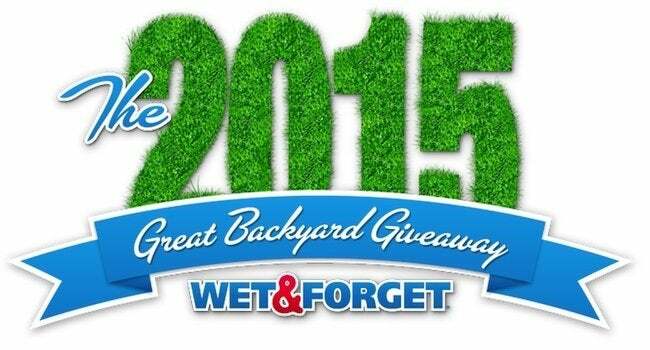 In other words, to win as many prizes as possible from the Wet & Forget 2015 Great Backyard Giveaway, it’s best to enter early and often! Wet & Forget Outdoor: Designed to eliminate outdoor mold, mildew, moss, lichen, and algae, Wet & Forget Outdoor can be used safely on virtually any outdoor surface, including but not limited to roofs, decks, and siding materials. You can even use it on outdoor fabrics or garden statues. You don’t need a heavy-duty pressure washer; Wet & Forget simply sprays on, then works with the rain and wind to gently remove stains and prevent mold and mildew for up to a year. Wet & Forget Indoor Mold+Mildew Disinfectant Cleaner: Rid indoor surfaces of mold and mildew—and in the process, prevent their regrowth—with a spray-and-wipe cleaner that not only eliminates stains, but also deodorizes and disinfects. Spray Wet & Forget Indoor on nonporous surfaces in bathrooms, kitchens, basements, and laundry rooms, and after letting the solution sit for 10 minutes, wipe the area clean. That’s it! There’s no scrubbing or rinsing required. Wet & Forget Shower: Say goodbye to your typical bathroom cleaning routine. Apply Wet & Forget Shower just once per week, and you’ll find that it’s painlessly easy to keep the bathing area clear of soap scum, mold, mildew, grime, and body oils. Simply spray the product onto the tub and tile, fixtures and doors, then rinse it off the next day. If you’re used to scrubbing up and wiping down bathroom surfaces, you’re going to love this easy, one-step process—and its soothing scent, too! Miss Muffet’s Revenge: Un-invite spiders from your home with Miss Muffet’s Revenge. With a single application, this potent solution can provide whole-home protection against spiders for up to a year. Controlling the spray couldn’t be easier, because the product includes a three-foot flexible hose with a precision nozzle on the end. Those components work in tandem to help you reach the corners and crevices where spiders hide, all without bending or stretching or climbing up a ladder. Now, with three weeks left in the Great Backyard Giveaway, there are plenty of prizes left to win. Scroll down to view details for all the drawings that remain. Wet & Forget takes the drudgery out of cleaning. Work smarter, not harder, and you can spend less time on chores and more time on the sweeter things in life—like winning free stuff! Hurry to capitalize on your chance to win Wet & Forget products and your choice among an array of stylish or practical prizes for the home. Good luck! This post has been brought to you by Wet & Forget. Its facts and opinions are those of BobVila.com.